Off the coast of New South Wales, Fish Rock Cave is Australia’s only true natural ocean cave dive, and one of the longest of its type in the world. Famed for its unique ecosystem, Fish Rock Cave is a large naturally lit cave two kilometres from Smoky Cape. Descending 14 metres to the shallow entrance of the cave, divers have the opportunity to marvel at the pink gorgonian corals that make this gateway to the dive so spectacular. At 120 metres in length, the cave’s visibility is usually stunning, with up to 30 metres of visibility. Many divers choose to enter the cave in the deeper section, where at 24 metres of depth divers enter the narrow cave in a east to west direction. Usually the entrance of the cave is ‘guarded’ by a plethora of fish such as the wobbegong shark, bull rays and a gathering of ladder-fined pomfret, to mention but a few. Traversing the cave watch your bottom time as it is easy to spend a great deal of time at 24 metres and run up on decompression time. 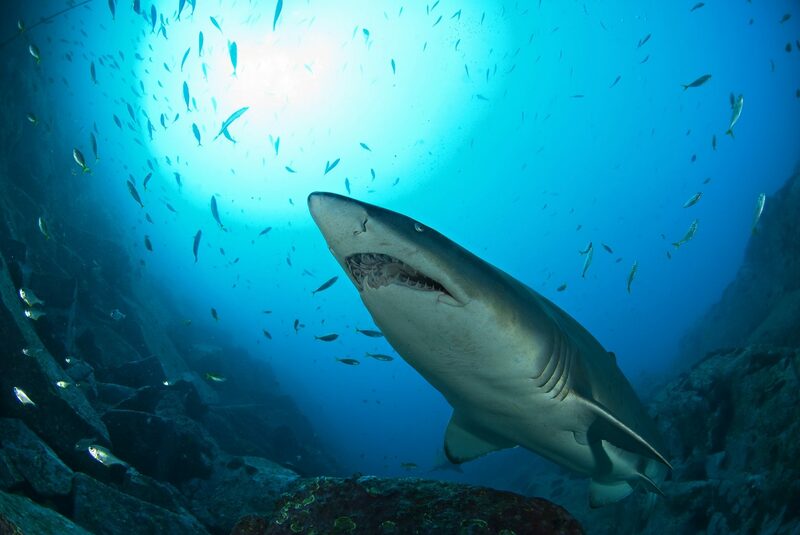 ‘The Gutter’ as it is known is a sand area where grey reef sharks often glide above your head within close proximity. With their livid, jutting teeth these large sharks are often misconceived as aggressive, yet the truth is that they are docile and calm in the vicinity to divers. Remember to stay calm in each encounter with sharks, a mutual respect between diver and fish is key. There are two large natural chimneys in the cave, the second being the one to follow to find the shallow entrance and the abundance of life that it holds. The cave is dark and narrow, yet teaming with fish, both small and large. As the tunnel becomes wider, light streams in from the shallow entrance, an ethereal moment where grey reef sharks surround you and approach safely within inches. In recent years divers have even encountered huge schools of hammerhead sharks outside the cave entrance. Fish Rock Cave is an underwater photographers dream, so make sure to fit a wide angle lens and a strobe to capture the grey reef sharks in their cathedral setting. Fish Rock Cave can be dived year round, however most dive operators based in Smokey Cape suggest diving between November and May where conditions are ideal, and live is bountiful. Furthermore with temperatures fluctuating between 20 – 25 degrees Celsius throughout the year divers need not worry about dry suits as 5 – 7mm wetsuits are sufficient.